If I told you there was just one and only, so good and tasty vegan paste that can help prevent and cure indigestion, bloating, gas, chronic constipation, diarrhea, irritable bowel, inflammatory bowel (UC, Chron’s), acid reflux, leaky gut, hemorrhoids, colon polyps, certain cancers like colon, breast, ovarian and prostate, chronic allergies, arthritis, autoimmune diseases, diabetes, heart disease, liver disease, high cholesterol, acne, eczema, atopic dermatitis, psoriasis, chronic fatigue, menopause syndrome, migraines, depression, anxiety, attention deficit disorder, and occasionally even autism and that it could help you lose weight quickly and easily without cravings, suffering, or deprivation, you might wonder if I had gone a little crazy. But it’s true. And the story goes like this. Our gut is at the center of our health and is a key factor in our nutrition and in improving performance, immunity, energy, body composition, mood and many other important elements of our wellness. The gut is controlled by the enteric nervous system (ENS), a complex system of about 100 million nerves that oversees every aspect of digestion. And all those neurons lining our digestive system allow it to keep in close contact with the brain via the vagus nerves. Recent research is demonstrating that the gut is almost like “second brain” in its link and connection to so many other areas of our body’s mental and physical function. Gut dysfunction can be linked to virtually every disease and can cause conditions like indigestion, constipation, diarrhea, leaky gut, hemorrhoids, weakned immunity, chronic infection, chronic fatigue, depression, anxiety, food sensitivities, reflux, chronic pain, autoimmune diseases, allergies, arthritis, obesity, diabetes, heart disease, liver disease, cancer, acne, eczema, atopic dermatitis, poor skin and more. At least 70 million people in the U.S. suffer from some sort of digestive illness (not including heartburn), and digestive problems account for nearly 10% of all healthcare spending. Our gut is one of the quickest parts in our body to repair itself. In a healthy gut lining, the epithelial cells that make up the mucosa are tightly packed together like a brick wall, and have contact points called tight junctions. This surface is semi-permeable, thereby allowing properly digested nutrients and water to enter into the body while preventing the entry of toxins and antigens. Repeated exposure to the toxins and antigens usually causes food allergies, food intolerances and/or inflammatory bowel diseases. This is commonly shown up with intestinal dysbiosis, candida overgrowth, leaky gut, abdominal pain and compromised immune function. A leaky gut often goes along with conditions such as: allergies, asthma, type 1 diabetes, mental illnesses (including depression and schizophrenia), autism, skin inflammation such as acne, rosacea, and eczema. The importance of our gut microbiome cannot be overstated. The gut microbiome, which hosts up to 1000 bacterial species that encode about 5 million genes, is also known as “our forgotten organ”. Our gut bacteria can breakdown food the body can’t digest, produce important nutrients, regulate the production of antibodies by the immune system, send messages to our brain and helps regulate metabolism, and produce hundreds of neurochemicals that the brain uses to regulate basic physiological processes as well as mental processes such as learning, memory and mood. Our gut is especially vulnerable to the presence of chronic (and even acute) stress, demonstrating stress-induced changes in gastric secretion, gut motility, mucosal permeability and barrier function, visceral sensitivity and mucosal blood flow. A healthy, balanced gut microbiome promotes a strong immune system and lower levels of chronic inflammation. An unhealthy gut microbiome has been linked to nearly every disease. The relationship between food and the gut microbiome is a two-way street: The food we eat affects the composition of gut microbiome, and the composition of gut microbiome affects how we digest and absorb our food. Not only can that an inadequate diet will also lead to the damage of gut function. Diets that lack tissue building protein, fats and fat soluble nutrients, minerals and vitamins can contribute to the breakdown of gut function. A distressed or damaged gut can’t act in our defense. Instead, it allows dangerous compounds to enter into the body. While it is true, useful and sometimes very necessary that we receive emergency treatment, medication or surgery, we must understand that our body is a self-healing mechanism. Our body’s innate Intelligence is ready, willing and able to repair our body – IF it receives the vital substances to optimally function and blissfully elevate our health. All of the vital substances in good food that our body needs to function properly and repair itself are great medicine that can prevent, reverse, and even cure disease. 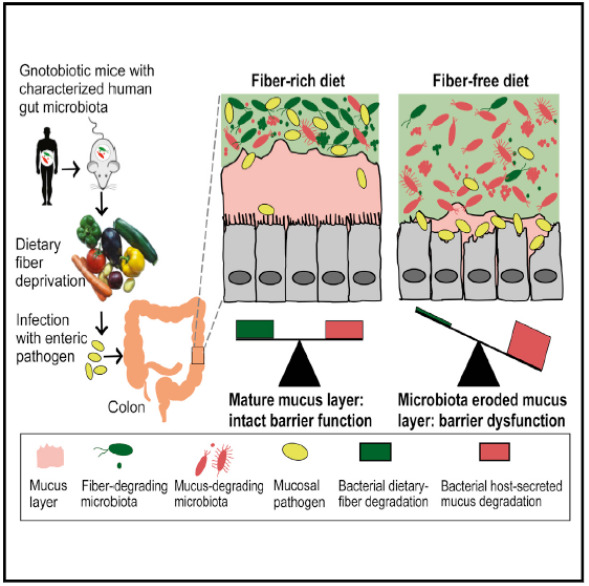 Source: A Dietary Fiber-Deprived Gut Microbiota Degrades the Colonic Mucus Barrier and Enhances Pathogen Susceptibility. So we come to the question, what must we do? Here are some of the best ways to maintain and restore a healthy gut naturally. 2. Eat plenty of fermentable fiber from diverse natural sources. 3. Eat different types of fermented foods that contain a lot of friendly probiotic bacteria. Can you figure out which food will be the best one that works for your gut health? You are now being offered a magical solution to improve gut microbiome and nutrient absorption, help heal GI tract lining, strengthen the digestive system, reduce inflammation, boost immunity, control appetite, regulate lipid and protein metabolism, balance hormones, improve neurological function, and recover body’s balance and overall health at the same time. 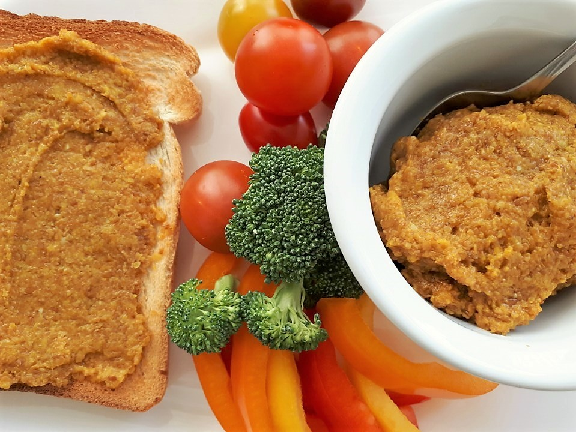 This wonderful solution is the fermented golden flaxseed based paste “FLAXZYM”. “FLAXZYM” was developed in Canada. It is designed to support the GI system with all the tools necessary to enhance digestion and bio-active nutrient absorption and support the cultivation of a healthy microbiome. “FLAXZYM” is so good and tasty gut-ecology paste. It is made from Canadian golden flaxseeds, fermented organic fruits, organic seeds, organic plant roots and enzymes, anti-inflammatory and immune modulating nutrients. And “FLAXZYM” is uniquely fermented by the enzymatic and microbial method. It contains everything we need to restore our digestive system and whole healthy body, including soluble and insoluble fermentable fibers, prebiotics, probiotics, synbiotics, peptides, enzymes and bioavailable mammalian lignans generated during the fermentation process, digestive enzymes, butyrate, short chain fatty acids, omega-3 fatty acids, bioactive essential fatty acids, vitamin B complex, anti-inflammatory and immune modulating bioactive nutrients. Lignan is a chemical found in the cell walls of plants. The main lignan from flaxseed hull is SDG (secoisolariciresinol diglucoside). When SDG is ingested it is metabolised in the gut by bacterial breakdown into the mammalian lignans, enterodiol and enterolactone. Cleavage of sugar chains must occur for SDG flax hull lignan, by the enzymatic and microbial fermentation, before the mammalian lignans are formed. This may offer efficacy advantages to enzymatically, microbially fermented “FLAXZYM”. Mammalian lignans are antioxidants that may also support the immune system and are excellent for balancing hormone levels in the body. They also have anti-estrogenic effects and can prevent naturally occurring (and sometimes radical) hormones from binding to estrogen receptors and exerting their negative effects. Lignans provide a weaker, cleaner estrogen to balance any deficit or surplus. Mammalian lignans from “FLAXZYM” is readily and completely absorbed in the digestive tract. Thus, the best bioavailability and most rapid uptake occurs for enterolactone and enterodiol formed from “FLAXZYM”. Appetite control: “FLAXZYM” can control hunger hormones. To lose weight, we generally need to reduce our daily calorie intake. Unfortunately, weight loss diets often lead to increased appetite and severe hunger. Even though we are not physically hungry, our body gave us the signal to eat. That?s the work of three hormones in our body that control hunger ? insulin, ghrelin and leptin. This can make it extremely difficult to lose weight and keep it off. The good new is that “FLAXZYM” can help reduce hunger, suppress appetite, eat less, and ultimately lose more weight. “FLAXZYM” stretches the stomach, slows its emptying rate and influences the release of fullness hormones. “FLAXZYM” contains healthy probiotics that are similar to those that live in our digestive tract. Thease healthy probiotics start producing new proteins that have some inhibiting effect on appetite. Our randomized trial demonstrating that increased “FLAXZYM” consumption is an effective weight loss strategy. Furthermore, there is evidence that “FLAXZYM” could help The Skinny people Gain Weight. “FLAXZYM” protects against the health problems including indigestion, bloating, gas, chronic constipation, diarrhea, irritable bowel, inflammatory bowel (UC, Chron’s), acid reflux, leaky gut, hemorrhoids, bowel obstruction, colon polyps, and certain cancers like colon, breast and prostate. “FLAXZYM” could also help prevent and cure many other health issues including chronic allergies, arthritis, obesity, increased appetite (emotional eating), autoimmune diseases, diabetes, heart disease, liver disease, high cholesterol, ageing skin, acne, eczema, atopic dermatitis, psoriasis, chronic fatigue, menopause syndrome, migraines, depression, anxiety, attention deficit disorder, and occasionally even autism. Simply eat “FLAXZYM” and enjoy all the comforts of restored digestion and gut function, optimized immunity and integrated whole and all systems working together. Currently, flaxseed has been the focus of increased interest in the field of diet and disease research due to the potential health benefits associated with some of its biologically active components such as fermentable dietary fiber, omega-3 fatty acids, lignans and minerals. Among the compounds that present biological activity, lignans are of special interest. Lignans, very complex classes of bio-active polyphenolic phytochemicals, are widely distributed in the plant kingdom. Flaxseed is particularly the richest source of lignans (9–30 mg per g), with lignan production at 75–800 times that of other oil seeds, cereals, legumes, and fruit and vegetables. There are two general types of lignans: i) those found in plant seeds like secoisolariciresinol diglucoside (SDG), isolariciresinol, matairesinol, lariciresinol and ii) those found in animals and humans known as mammalian lignans. The principal dietary lignan present in flaxseed is SDG which occurs as a component of a linear ester-linked complex. Plant lignans can be converted by intestinal bacteria into the bioavailable lignans, so-called enterolignans, enterodiol and enterolactone. ⦁ Flaxseeds are the richest dietary source of fermentable dietary fiber, omega-3 fatty acids and lignan precursors. ⦁ When consumed, lignan precursors are converted to the bioavailable enterolignans, enterodiol and enterolactone, by bacteria that normally colonize the human intestine. Lignan-rich foods like flaxseed are a healthful dietary pattern in the prevention of hormone-associated cancers, osteoporosis, cardiovascular disease, diabetes, and menopause symptoms. Flaxseed is also the richest source of soluble, insoluble and fermentable fiber. For years, researchers had us making distinctions between soluble fiber, the kind that forms a gel with water, slows our digestion and keeps our blood sugar even, and insoluble fiber, which bulks up our stool and prevents constipation. Now “fermentable” is becoming the new buzz word(although scientists have known about it for a long while). Healthy bacteria in our gut feed on fermentable fiber and turn it into butyrate and other short chain fatty acids. Short-chain fatty acids produced when the gut bacteria ferment fiber in the gut are the main source of energy for the cells in the lining of our gut. In turn, those fatty acids control appetite and blood sugar, regulate inflammation and improve our immune system. Butyrate also helps quiet genes that drive cancer and heal the intestinal lining, often damaged by chemotherapy. One investigation discovered that adding more fiber to the diet can trigger a shift from a microbial profile linked to obesity to one correlated with a leaner physique. Another recent study shows that when microbes are starved of fiber, they can start to feed on the protective mucus lining of the gut, possibly triggering inflammation and disease.